Given what it tastes like it wouldn't be surprising if one or more of the employees painted a huge bullseye on the roof with "Bomb Here!" In it. All of which has made me think. 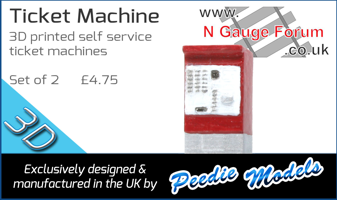 I have been trying for 15 years on and off to build an N gauge branch terminus that runs properly, and never quite succeeded. Sometimes I just want to sit back and watch the trains go by. So I am thinking about turning the TLR into a simple oval on a 4' x 2'6" board. Nice sweeping curve through the station and a couple of sidings, all laid in Finetrax at the front, Setrack at the back where you can't see it, with a couple of road bridges to hide the point where finescale becomes coarse scale. Very similar to Ian Futers' "Longwitton" which I saw at an exhibition in 1978 and which has had more influence on my modelling than anything else. So instead of a terminus at Teviothead I will have the intermediate station at Branxholme. Shame about the Spam depot. Thanks for those nice photos. Ultimately, it should be F U N! So, design what will make you happy. 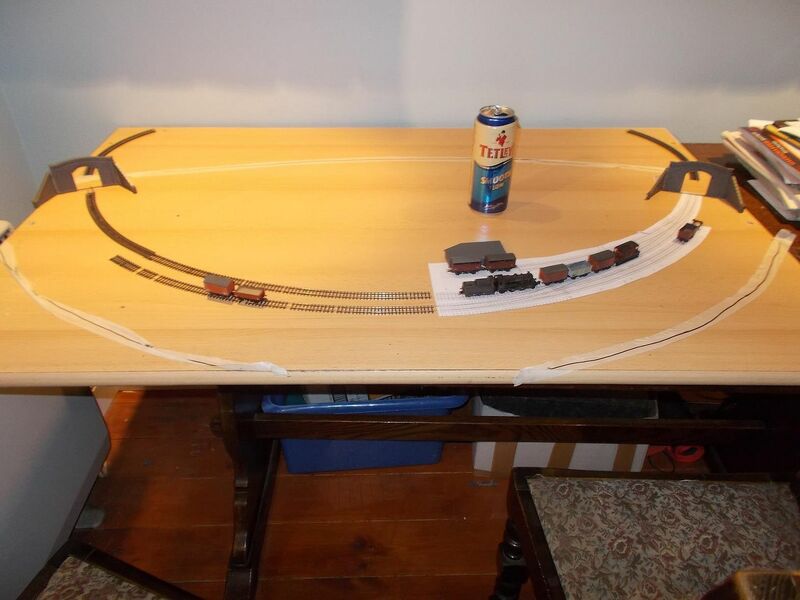 My first N Gauge layout was a chipboard base, resting on a chest of drawers, with double ovals with two stations, top and bottom, and sidings inside at the bottom half and to left and right. There was a tunnel to the left and a quarry at the edge. Very simple and unrealistic but I enjoyed watching the trains run around the two ovals and in and out of the sidings. I really should have started this thread in the Layout Planning section, but I already had a plan. The only problem is that I keep changing it. I should also have finalised the plan before I started ordering stuff on Finetrax. Never mind, I have now done a bit of construction. It's modelling, Jim, but not as we know it. I drew out the plan on paper, but it had a few slightly unconventional features and I couldn't picture how it would look. So I knocked together a half-size version using a giant cardboard box, balsa and Evostik. It was fun. The idea is to use Setrack no 2 curves for the hidden section, which gives me near enough a constant 2 foot radius in the bit you can see. I have shaped the front of the board to follow the line of the trackbed and curved the backscene slightly, so that the scenic area is elliptical, like the wings of a Spitfire. I'm trying to give the impression of a railway winding its way through the hills, following the contours to avoid major earthworks as real branch lines tended to do. Track plan is a cross between Ewesley and Longwitton on the Rothbury branch - goods siding with a completely pointless "kick back" (I wonder if this was ever actually used?) and a cattle dock. Station building is based on Ewesley. 16 ton mineral and a couple of 3-plank dropsides await unloading in the goods siding. I started measuring up the 2MT to see if I could carve one out of balsa, then realised things were getting silly. Typical North British platelayers hut. Those turnouts are going to be a problem. I have found that you can indeed flex a Finetrax turnout by cutting away some of the webs in the milled base, and it doesn't fall to bits when you do it. 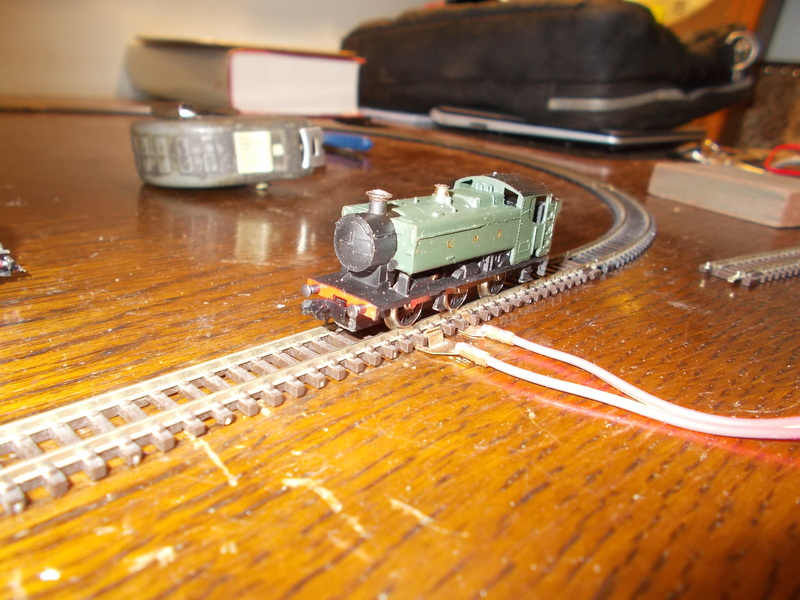 But I have ordered B6 turnouts, and when they are bent the inner curve is a bit tight for comfort. I might have to go for B7 or even B8 which will mean shifting the crossover towards the station. The siding is plenty long enough to get away with this. Setrack fiddle yard, nice and simple. 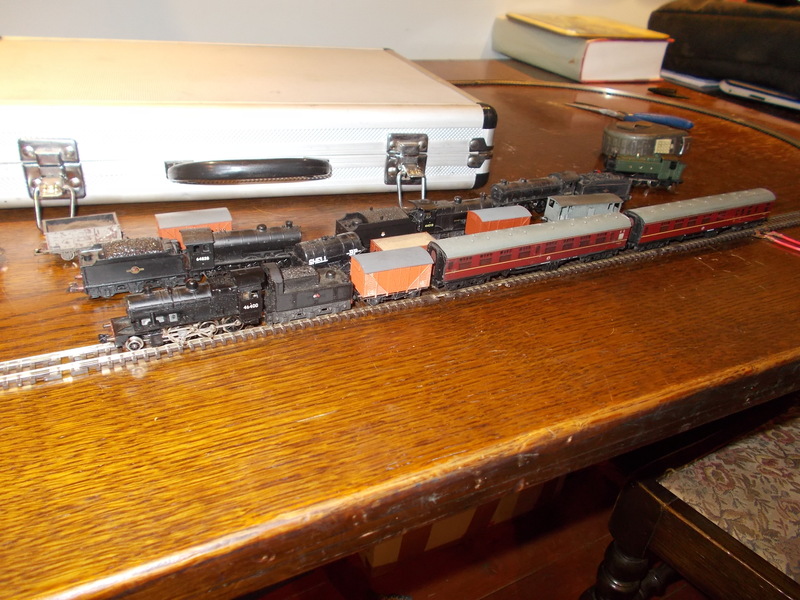 Loops will take a loco and 8-9 wagons, or two coaches and two vans - plenty. The fiddle yard area will fold up through 90 degrees on flap hinges for storage and transport. P.S. Sorry photos are links rather than embedded. Photobucket seems to have fallen over and died, and Google Drive doesn't want to share images direct to other websites. Thanks for this update, Richard. I like the rough model. I think after the scenery has been finished the tight curves will be less noticeable. Looking forward to seeing it develop. Station building - I thought I would build something like Brinkburn or Ewesley - simple wooden building, no awkward roof angles, but the stations weren't photographed much. Then I found a really lovely EM gauge layout based on the Rothbury branch which has some good clear photos of the buildings. Assuming the doors are 6'6" x 2'6" or so, there's enough there for me to put together some scale drawings to work from, so (since I can't afford baseboard materials yet) I'll get cracking on that bit. A model of a model! Couplers - shunting the cattle dock will involve propelling wagons round a no. 2 Setrack curve. My home made couplers won't cope with that, so it looks like I'm back to trying to get the Microtrains knuckles to work reliably. I have learned an awful lot about very small magnetic couplers through trying to design my own, and playing around on the dining room table I think I have found an uncoupler design which will work. It uses under-track magnets - I tried that before, but the Peco sleeper base was too deep for them to work properly. With Finetrax it is a different story. Next stage there is to build a simple "shunting plank" in Finetrax and make sure the uncouplers work properly with real shunting operations. Track - those curved points are still bothering me. My modified Finetrax B6 turnout fell to bits all by itself when left in a drawer, so maybe cutting away the milled base isn't such a good idea. The alternative is to build them from soldered PCB construction using Templot templates and 2mm Association parts. At least there are only three to worry about, so it's possible. Control - I'm thinking of DCC again. Mainly because I'm still not convinced that I can get reliable slow running with a track voltage of 0.8V which is what the 2MT takes to start moving on pure DC. I didn't get on with the Bachmann system with that paddle controller, can anyone recommend a nice simple DCC system with a proper control knob? I don't need wireless handheld, sound, accessory control or the ability to run lots of trains simultaneously. I DO need really good slow speed control. Really looking forward to this one now. I have a book out next month (nothing to do with railways) so I'll use the windfall from that to pay for the baseboards and maybe a DCC package. Thanks, Richard, for the latest update and full explanations. Still no construction, but another major planning session last night with some help from the FBM (Friendly Beer Monster). I spent a couple of hours getting to grips with Templot - as others have said it isn't the easiest program to teach yourself, but I ended up with a full size template for all the pointwork. So I took an old desk top, marked out the scenic area (4' x 2') with sticky tape and started playing around with templates and flexi track. It fits! The template needs reworking - the outer two turnouts are about right but the middle one was supposed to be a B8 and somehow ended up as a C6 which makes for some very strange track alignment at the crossover. I'm not entirely happy with having identical road bridges at each end as scenic breaks, looks a bit too "model railway" but I can't think of any other solution at the moment. Luckily I don't have a lot of track to build so I can think about fiddly, time-consuming solutions. One possibility is to take OO/EM PCB sleeper strip, plane it down to the right width for "N" crossing timbers, mark out the chair bases on each sleeper with etch resist pen, then drop the whole lot in an acid bath. I tried peeling the copper cladding off a PCB sleeper with a scalpel, leaving just a small amount for the chair plate, then soldering a rail to it, and it seems like it will be strong enough. With the copper cladding removed the sleeper height matches the Finetrax, near enough anyway. Just need to find out what kind of acid to use - how did modellers cope before Google was invented? Alternatively I could do all the plain track in PCB to match the pointwork, but I have already bought several yards of Finetrax and it is really very pretty. Also thinking about ways of fixing down the track. I would normally use PVA glue and heavy weights to keep the track flat until it dries. But when I was setting up the full-size plan last night I found some Duck double sided clear carpet tape. I used it to hold the Setrack curves in position and had no end of trouble removing them afterwards. 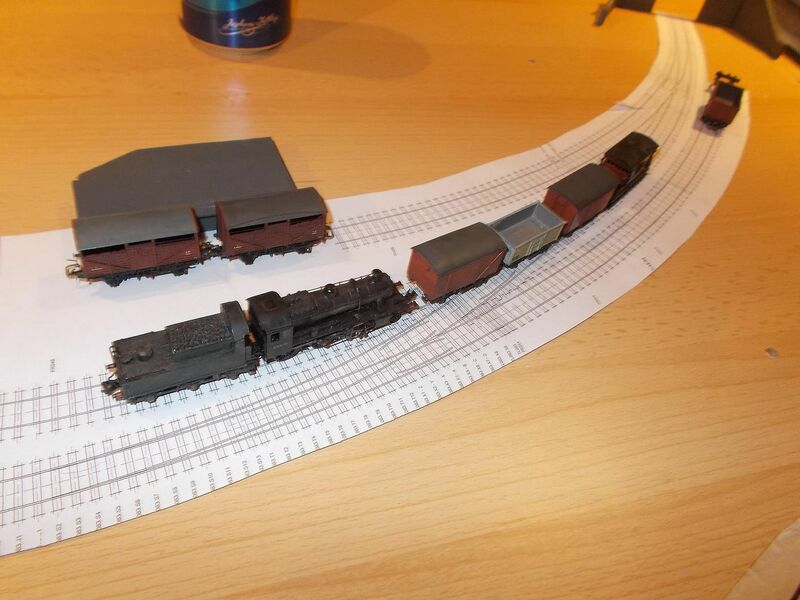 So I am wondering whether I can use this stuff for tracklaying. I made a short test piece, with a length of Finetrax stuck to a piece of hardboard, "lizard sand" sprinkled over and tamped down, surplus sand removed and the whole lot painted black. Bingo - lightweight ash ballast with plenty of sleeper showing, just like the track on most Borders branches. There seems to be some scope for final positioning of track - it doesn't really stick firmly to the tape unless you press it down. But once it's stuck, it seems to stay stuck. Now I need to come up with a point operating mechanism. My head is full of levers, cranks and springy wires, and I definitely need to come up with something reliable before I start building baseboards and laying track. So that will probably be the subject of the next planning/fiddling session. In a way it's a good thing that I can't afford baseboards yet - normally by now I'd have them built, track laid and be starting to discover all the problems that a bit more careful planning would have avoided. could use VHB tape. Its pressure activated so you could reposition track before finally pressing down hard to permanently* fix in position. Looking good, I will add your thread to my reading lists. 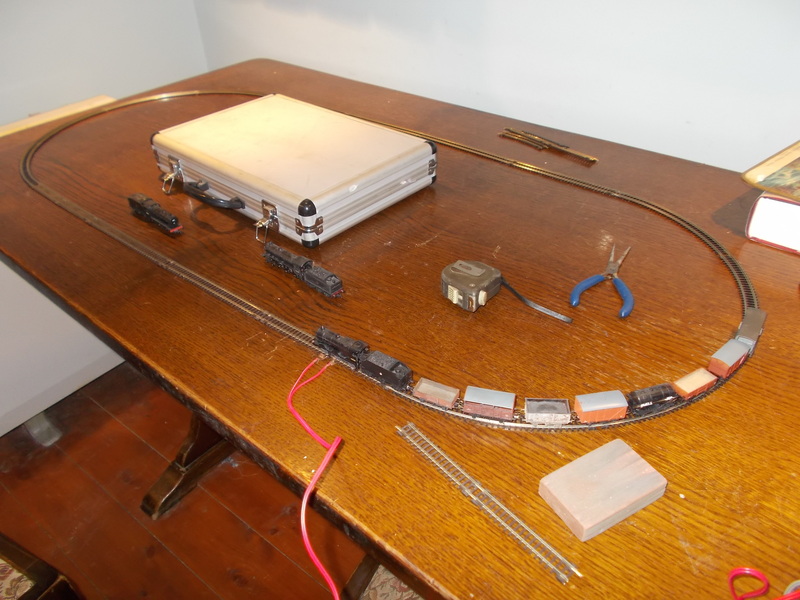 How did you re-motor the Ivatt? It was a very long time ago and I don't remember the details, but I think I used a Farish gear worm on a Mashima 1015 motor and glued it to the chassis with Araldite. I might take the body off it this evening and have a look. I like the look of the trackplan and general layout Richard, it has a real Borders feel to it. My next layout which also just in planning at present is to be called "Dreadwater" and represent a fictional station on the Riccarton Junction - Hexham line. 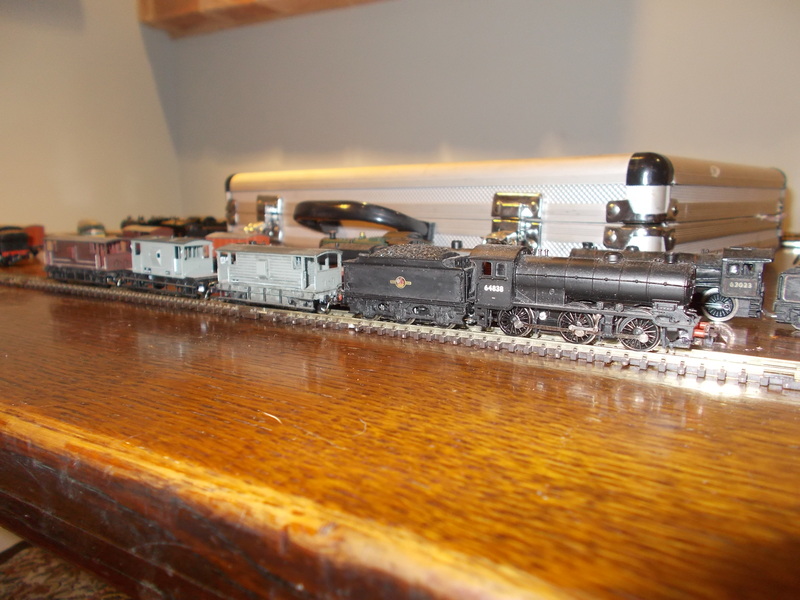 Miraculously in my world the line survived into the 60s and it will feature some early diesels as well as steam. I am even pondering a plausible reason for the line's survival of the line into the 70s so that I might feature blue diesels..